Over to the south-west of the city of Derby lies the Alvaston driving test centre. You'll need to head into the depths of an industrial estate to start your test, which will soon progress across the city's roads. 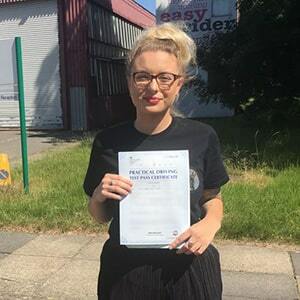 If you're looking to get to know your chosen test centre better—as we advise all learners to do—keep on reading below for directions, pass rates, test routes and much more about Derby Alvaston. Derby Alvaston test centre is located between Wilmorton and Alvaston. The centre is just off the A5111 Raynesway, so learners won't have any difficulty in getting to it. Not had the chance to look around Derby Alvaston yet? That's fine. Just use these directions and you'll get there with little-to-no effort at all. Been scouring the internet trying to find the Derby Alvaston test route? While we’re sure you’re not the first learner driver to do so, you should know that the DVSA doesn’t publish routes anymore. This means that any routes you do find won’t be up-to-date. This shouldn’t matter too much, however. That’s because your instructor will have you honing your driving skills on the roads that will most likely feature on your practical. Before you know it, you’ll know most of the area like the back of your hand. If you'd like to see examples of roads that might crop up on your test, have a look for videos of Derby Alvaston test routes on YouTube. While the pass rates at Derby Alvaston aren’t the most impressive, you should bear in mind that it’s all down to personal ability at the end of the day. As long as you and your instructor are sure you’re ready for your test, you should be just fine. Want to distract yourself from your impending test? Have a laugh at these driving test horror stories. What If I Can’t Go To Derby Alvaston? If Derby Alvaston isn’t an option for you, there are two alternate test centres in Derbyshire: Buxton and Chesterfield. Hate waiting for results? You’re in luck—you get your results as soon as you park back up at Derby Alvaston test centre. The examiner will give you a feedback sheet and additional verbal comments regarding your performance. If you pass, the examiner will also hand you your much-deserved test pass certificate. Believe it or not, plenty of learners have needed a few attempts to actually pass their driving test. What’s important is what you do to improve yourself in time for your next test. If you're ready to go again, PassMeFast can book you in for a new test ASAP. And if you’re looking for a confidence boost, you can book onto one of our refresher courses. Simply call us on 0333 123 4949 or contact us online to get started today. If you’re someone looking to get on the road in Derby in a matter of weeks, you’ve come to the right place. PassMeFast offers a range of courses that can be taken in an intensive or semi-intensive manner—fit entirely around your busy schedules. Our instructors will help you become a safe and confident driver in time for your fast-track practical test. Head on over to our course prices page to look at our 9 tailored course packages. Once you’ve got an idea of what you want, talk to one of our sales team members on 0333 123 4949 to get booked in. Alternatively, book a course online yourself to take one step closer to getting on the road. Passed my test with PassMeFast first time! I purchased 10 hours which I completed in just over a week. Definitely recommend 100 percent.